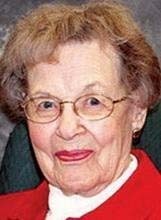 WATERLOO — Ruth M. Swanson Anderson, 91, of Waterloo, died Tuesday, May 1, 2012 at Covenant Medical Center. She was born Sept. 23, 1920, near Sioux City, daughter of David and Mary Petersen Swanson. She married Henry C. Anderson on June 5, 1941, in Hinton. He died March 19, 1993. Mrs. Anderson taught in rural schools in Plymouth County and in the Waterloo Community Schools for a total of 30 years. Survived by three sons: Ron (Ann), Gary (Barb) and Dennis (Becky), all of Waterloo; a daughter, Marlys Anderson of Chapala, Jalisco, Mexico; nine grandchildren; 16 great-grandchildren; and a brother, Francis Swanson of Sioux City. Services: 10 a.m. Friday at Bethany Bible Chapel, with burial in Garden of Memories Cemetery. Visitation from 6 to 8 p.m. Thursday at Kearns, Huisman-Schumacher Chapel, and for an hour before services Friday at the church. Memorials may be directed to the Friendship Village Auxiliary Fund or Bethany Bible Chapel. Ruth enjoyed painting, sewing, reading, traveling and volunteering. At age 17 she accepted Jesus as her savior, which led to her witnessing to friends, teaching Sunday school in Sioux City and at Downing Avenue Gospel Hall for 20 years and being an active member of the church missionary class in Waterloo.